Tic Tac mints were first manufactured in 1968, becoming a consumer product a year later under the brand name "Refreshing Mints". In 1970 Italian manufacturer Ferrero changed the name of the mints to Tic Tac, as a tribute to the «tic» and «tac» sound of the iconic little box opening and closing. Tic Tac very early on became a love brand across Western Europe and North-America. The following years have seen the development of the breath mints category within the wider candy market. Ferrero has strived for innovation, among them the development of the Tic Tac Breeze, sugar free pills available in delicious flavors with cooling micro crystals. Tic Tac mints have been available in Israel since 1997, and as of 2002 they are regularly advertised a variety of media channels. Israel Tic Tac follow the global vision of the brand "Tic Tac spark refreshing moments people need to enjoy the everyday" with the communication ‘Refresh The Moment’, boldly expressing the brand’s values as a breath freshener that also refreshes our mind and even our mood. As of 2016, the brand marketed in Israel by the Group’s local office. Since then Tic Tac has moved from the sixth to the third position in value in the pocket candies category (MAT August 2018, Nielsen NR). The candy and breath mints market is continuously growing. Tic Tac competes locally with two other leading imported brands, alongside well-known Israeli brands. The unique, recognizable shape of Tic Tac mints, as well as its compact and hermetically sealable pack, contribute to the brand’s differentiation from its competitors. A typical impulse product, Tic Tac continues to update its range of flavors and innovative in and out activities. 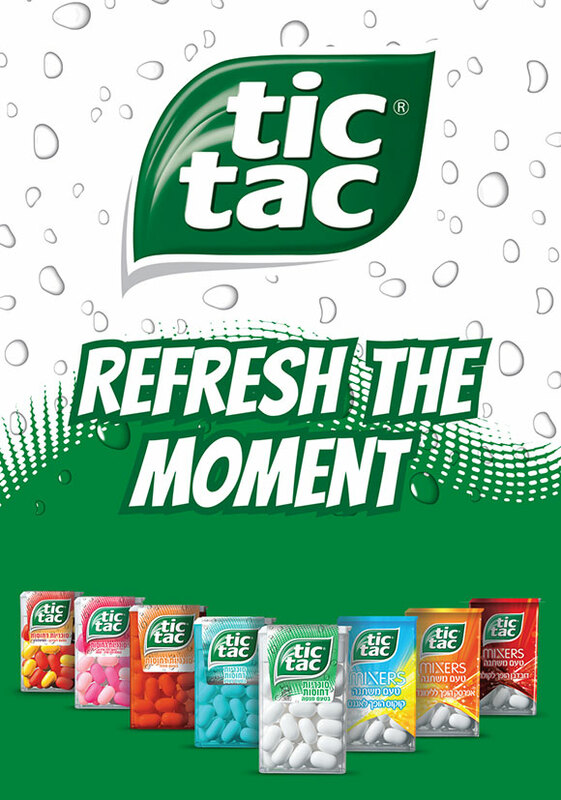 Over the past two years Tic Tac brand has launched a global campaign aimed at refreshing its brand perception while strengthening and maintaining its differentiation within the market. Tic Tac’s rebranding as a product that brings a ‘spark’ into daily routine has further emphasized the brand’s values of freshness of mind and mood. Tic Tac has taken on the challenge of not only being the favorite mint for refreshment but a source of fun in the daily lives of the consumers. Rebranding and reinforcing visibility at points of sale – Within the continuously changing local candy and breath mints market, Tic Tac has acted to strengthen its relationship with Israeli consumers by launching new flavors and creating an updated branding for the product’s packs. This year Tic Tac has unveiled the new branding of its packs, with silver labeling In addition, Ferrero has strengthened visibility at the points of sale, with a range of bottle packs. Product Innovation – Tic Tac has launched "Tic Tac Mixers – A Flavor Changing Experience" cherry-cola, coconut-pineapple and peach-lemonade flavors, featuring an innovative and advanced technology that changes the flavor of the mint while it melts in the mouth. Consequently, the brand has won the 2018 "Product of the Year" award for innovation in the candy category. Finally, in the past year the brand has launched a special Purim edition entitled ‘Fruit Adventure’. Tic tac through its innovative technology "Write On Pills" has released limited edition products in partnership with licensors such as Simpsons(2016) and Minions (2017); where characters are drawn on the pills with an in out flavor inspired by the characters. Occasion Management: To increase local relevance, Tic Tac has launched special packs for Purim with a unique mix flavor entitled "Fruit Adventure" emphasizing the fun side at the heart of the brand vision. Badatz Kosher certification – Tic Tac now offers its spearmint and mint flavor with the Badatz Kosher certification stamp, thereby making the brand accessible also to religious and ultra-religious populations. 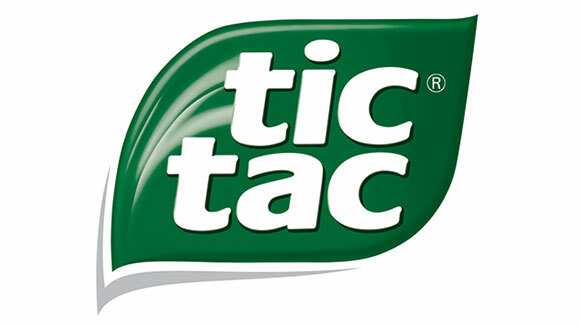 Collaboration with The Amazing Race reality show – the popular show has collaborated with Tic Tac, embracing its brand values of enjoying the moment and adopting an original and unique worldview through sparking product placements. Tic Tac was among the main sponsor of the show, as well as of the prizes offered to participants and viewers. Full Engagement: To communicate their results and promote their complete Tic Tac range, Ferrero Israel created 800 Tic Tac boxes, given to journalists and top influencers, store managers, merchandisers and most importantly fans. Ferrero sells over 40 billion Tic Tac mints every year. Tic Tac’s first ever flavors were mint and orange. In the last decades, Tic Tac reached an all-time high fame with spontaneous placement in iconic movies. It takes 24 hours to produce one Tic Tac mint. "Tic Tac Mixers" feature an advanced technology that changes the ﬂavor of the mint while it melts in the mouth. 1969 Ferrero begins selling Tic Tac mints under the name "Refreshing Mints". 1974 Tic Tac offers new flavors such as cinnamon, aniseed, apple and lime. 1997 Tic Tac mints are commercialized in Israel. 2016 Ferrero opens its office in Israel. 2018 Tic Tac Mixers the changing flavors pills won the "Product of the Year" thanks to its innovative technology.